Step 1 Put flour in a large bowl. Make a well in the center and pour in one-half cup cold water. Slowly stir with chopsticks or a wooden spoon, moving from the center toward the rim, to work in all the flour. (Add more water by the teaspoon until most of flour is incorporated.) Keep stirring as a ragged, soft mass forms. Then use your fingers to gather and pat the dough together into a ball. Transfer to a work surface and knead for about 5 minutes, until smooth, fingertip-soft and slightly elastic. (You shouldn't need any additional flour on the work surface if the dough was properly made. Keep kneading, and after the first minute or two, the dough shouldn't stick to your fingers. If it does, work in a sprinkling of flour.) Press your finger into the dough; the dough should spring back, with a faint indentation remaining. Step 2 Transfer dough to a plastic bag and seal and let stand at least 10 minutes, covered. Step 3If not using immediately, cover and refrigerate the dough until needed up to 1 day. Step 4To wrap the dumplings, divide the dough in half, keeping half wrapped. Transfer the remaining half to a work surface and gently roll into a 12-inch log about three-fourths inch in diameter. Step 5Cut the log crosswise into 18 (two-thirds inch) pieces, rolling the log gently between cuts to keep it round. Generously dust the dough with flour to keep the pieces separate, and gently flatten each round piece into a circle using the palm of your hand. Step 6Roll each piece into a 2 1/2 -inch round wrapper (this is easiest using an Asian dowel-style rolling pin), rolling the outer one-half inch edge very thin, like a tortilla (the center of the circle -- a little more than 1 inch -- will remain slightly thicker). Use 1 hand to roll the dowel back and forth while the other hand rotates the circle, like a steering wheel, to form the wrapper. Repeat with the remaining pieces, loosely covering each wrapper to keep it from drying out and dusting the wrappers to keep them separated. Repeat with the remaining dough half. Step 7Form the dumplings: Hold a wrapper in a slightly cupped hand. Use chopsticks, a dinner knife or spoon to center about 2 teaspoons of filling on the wrapper, pressing down gently and keeping one-half to three-fourths inch of the dough clear on all sides; your hand will automatically close slightly. Step 9Position the dumpling so the sealed edge rests against the palm and along your first finger. Cup your other hand around the dumpling hand and bring your thumbs together and press firmly to seal the edge. In Recipes-list.com we have selected the most viewed recipes from category - Appetizers Best recipes Healthy eating . Enjoy the best recipes specially selected for you! 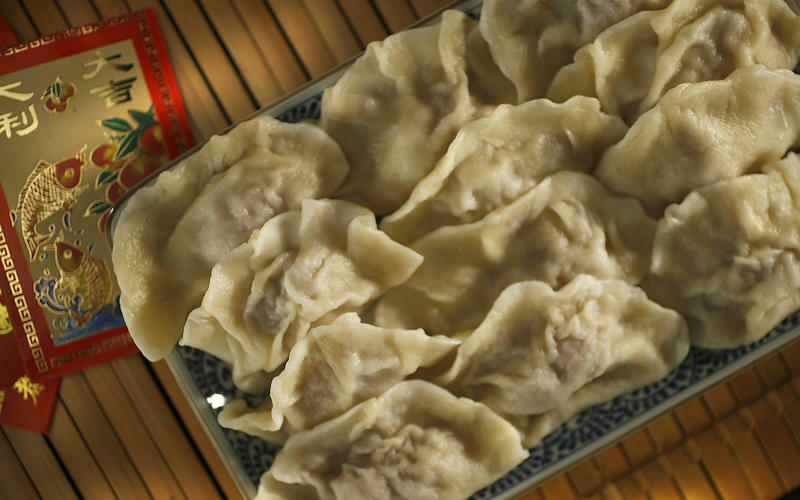 Boiled dumplings is the right choice that will satisfy all your claims.